What are the primary supply chain management trends for 2019? Buzzwords like digitization and globalization are still transforming the world, and concepts like AI, IoT and eCommerce are as relevant as ever – but you already knew that. In this post we will present recent trends you may not have heard of – yet – but ought to keep an eye on as they develop. Let’s dig into the future supply chain trends that could transform your supply chain and logistics operations! At what point does long delivery time become a deal-breaker for you? Amazon, arguably the most prolific user of distributed inventory, has found that customers placing orders with three- to five-day delivery are disappointed if the package does not arrive within a couple of days. In this sense, customers are demanding better service than they are openly asking (or paying) for. Distributed inventory reduces the lead time from a customer placing an order to the product being delivered while simultaneously reducing shipping costs. This strategy involves keeping inventory in multiple distribution centers, strategically positioned near the customers, to be able to fulfill customer orders by delivering from multiple warehouses. For businesses, this means higher customer satisfaction rates and higher sales numbers with shorter delivery lead time. But these additional warehouses and storage facilities need to be cost optimized to really reap the reward of distributed inventory, which puts focus on accurate demand forecasting among other inventory management techniques. Digital twin is a technology many suppliers and manufacturers will need to consider in coming years. But what is digital twin technology? Essentially, it is a digital replica of a product, process or service. The technology acts as a bridge between the digital world and physical reality by using sophisticated sensors on physical components to gather data such as working condition, real-time status, or position. A real-life example of digital twin technology can already be seen in some modern cars. Historically, car owners would visit the repairman once something broke in the car and now needs to be repaired or for regular maintenance inspections to prevent the car from malfunctioning. Now, digital twin technology can reduce the cost of repair and downtime of your vehicle by having your car tell you when any of its parts are about to break down through a digital twin. Car owners with digital twin technology implemented would not get stranded because the engine broke or have to go to a routine inspection to replace a part that will actually work for another year. For dealers, digital twin technology can optimize stock and reduce lead times by exchanging data with the cars to know ahead of time when the car will break down. This way, replacement parts can be ordered ahead of time to be ready for when car owners take their car into the shop. Companies today have to consider the resilience of their supply chain and do their best to reduce risks. In a world where off-shoring, outsourcing, interdependencies within supply chains, and product versatility increases risk, effective supply chain management becomes increasingly important. Making the supply chain more flexible to accommodate for higher risks can be done by closely cooperating with suppliers and distributors to find alternate supply routes if needed and by closely monitoring potential external risks and maintaining a good incident response plan to deal with disruption. Transparency throughout the supply chain can help mitigate potential risks within the supply chain itself, and increased supply chain visibility leads to additional benefits. For those of us who are not data scientists, making sense of statistical data requires asking IT for help. For those of us who are data scientists, it can be pretty distracting to constantly be helping less tech-oriented colleagues extract and analyze data. But with augmented analytics, anyone will be able to extract reports from non-user-friendly databases – here’s how. Augmented analytics focuses on a specific area of augmented intelligence: using machine learning to automate data analytics, preparation and sharing. Through advanced manipulation and presentation, data is simplified to present clear results and provide access to sophisticated tools, allowing users to confidently make day-to-day decisions. Augmented analytics helps your average business user visualize data in a way that’s easily understandable. In other words, this phenomenon will enable employees, whose main job is not in the field of statistics or analytics, to analyze and draw conclusions from data previously incomprehensible to the untrained eye. These emerging trends aren’t the only things impacting your supply chain in 2019; the global climate is continually changing and affecting worldwide trade. As supply chains are now globalized, with companies sourcing from and delivering to different companies, trade agreements need to be in place. However, this has proven to be a challenge in recent years. One striking example for US distributors is the ongoing US-China Trade War. Stemming from President Trump’s campaign to bring manufacturing jobs back to the US and allegations of China stealing intellectual property, the US has been imposing targeted tariffs on China since July 2018. Both sides have escalated the trade war, resulting in the US setting tariffs on $250bn worth of Chinese products (and another $267bn more threatened) and China setting tariffs on $110 bn worth of US products (with qualitative measures threatened that would affect US businesses operating in China). In December 2018, however, the US and China agreed to a temporary truce and have refrained from increasing tariffs or imposing new ones until March 1, 2019 while the two sides work towards a deal. But for companies both in the US and China, the existing tariffs have caused losses in capital and supply chain efficiency – particularly for small- and mid-sized businesses who source primarily from China. Whereas enterprise-sized companies already have diversified sourcing geographies, SMBs are struggling to switch to new suppliers in other countries as they cope with the impact of existing tariffs. Regardless of how talks go for the March 1 deadline, global growth has slowed for 2019, making companies more cautious about their spending. SMBs should keep an eye on tariffs and developments that directly impact their supply chain. The only thing constant is change, and we can be certain that 2019 will be another turbulent year both in terms of global macro trends, politics and economics as well as changing consumer behavior and technological development. So what can you do to set up your supply chain for a successful year? Making sure your inventory is healthy is a good start. 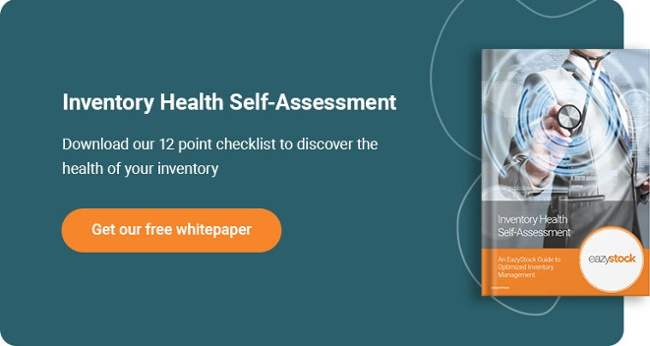 Download our Inventory Health Self-Assessment, and evaluate the state of your inventory to see where you can make changes.